A novelty at Sainte Marie-aux-Mines 2017. Strongly elongated and doubly terminated native Gold in hooked growths. They are on matrix with radial and felted aggregates of acicular Erythrite crystals. These native Golds from Bou Azzer were noted a long time ago so this recent rediscovery must be considered as a novelty; at the same time a curiosity and a rarity. We analyzed these Golds to confirm the presence of Silver and, effectively, they are 26.1 % Ag with a 0.8 % As. We’ll send a copy of the analysis to the buyer. A novelty at Sainte Marie-aux-Mines 2017. Strongly elongated and doubly terminated native Gold in hooked growths. 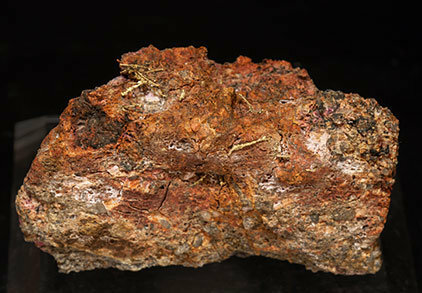 They are on matrix, with radial and felted aggregates of acicular Erythrite crystals. These native Golds from Bou Azzer were noted a long time ago so this recent rediscovery must be considered as a novelty; at the same time a curiosity and a rarity. We analyzed these Golds to confirm the presence of Silver and, effectively, they are 26.1 % Ag with a 0.8 % As. We’ll send a copy of the analysis to the buyer. A novelty at Sainte Marie-aux-Mines 2017. 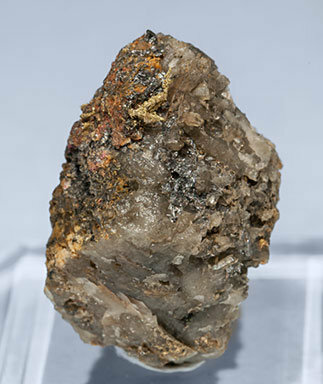 Arborescent growths of small native Gold crystals on a Quartz matrix with an indeterminate dark gray metallic mineral. These native Golds from Bou Azzer were noted a long time ago so this recent rediscovery must be considered as a novelty; at the same time a curiosity and a rarity. We analyzed these Golds to confirm the presence of Silver and, effectively, they are 26.1 % Ag with a 0.8 % As. We’ll send a copy of the analysis to the buyer. A novelty at Sainte Marie-aux-Mines 2017. Strongly elongated and doubly terminated native Golf hooked growths. 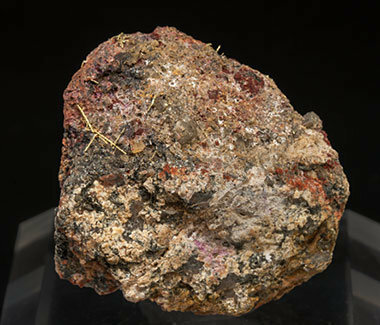 They are on matrix, with radial and felted aggregates of acicular Erythrite crystals. These native Golds from Bou Azzer were noted a long time ago so this recent rediscovery must be considered as a novelty; at the same time a curiosity and a rarity. We analyzed these Golds to confirm the presence of Silver and, effectively, they are 26.1 % Ag with a 0.8 % As. We’ll send a copy of the analysis to the buyer. 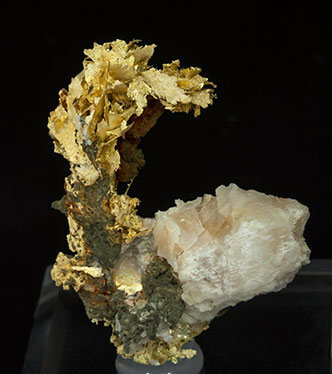 Very aerial leaf of Gold (electrum variety) crystals, very rich in silver (27% aprox.) and that have fine saw-like edges. We’ll send a copy of the analysis to the buyer of the sample. A novelty at Tucson 2016. 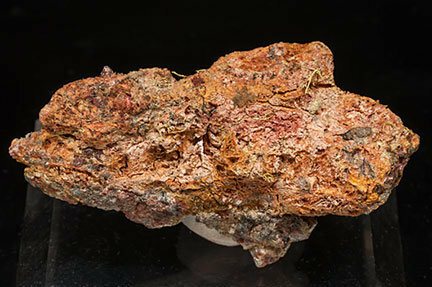 Aggregate very rich in silver (27% aprox.) 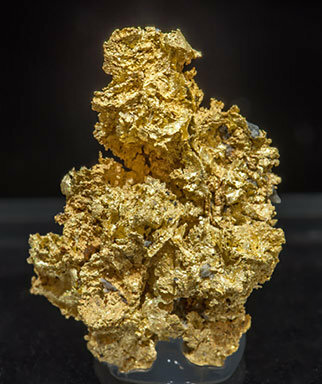 leafy Gold crystals (electrum variety), with flat octahedral crystals in groups that resemble leaves. 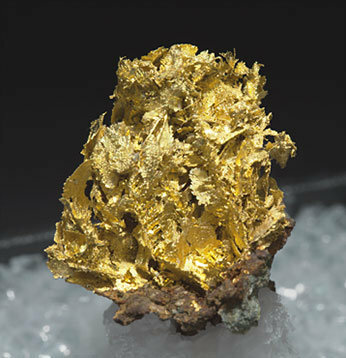 Its color is the classic "old gold" of electrum due to its Silver-rich composition. A novelty at Tucson 2016. Very aerial aggregate rich (27% aprox.) 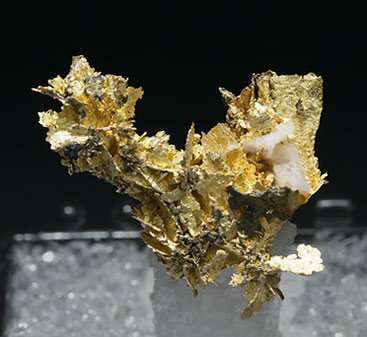 in silver leafy Gold crystals (electrum variety), with finely saw-like edges and on a Calcite matrix. One of the best samples of that find.